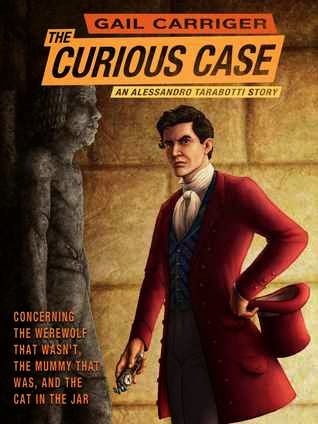 Here, we finally get to meet Alexia's father, the legendary curse-breaker Alessandro Tarabotti. Set decades before the events of Soulless, we get a glimpse of what life might be like for a preternatural man, with more freedom in Victorian Britian than even Alexia could ever enjoy. Alessandro is in Egypt, hunting down reports of a mummy preserved in the Anubis form. Such things are unheard of, and with Egypt's ban on werewolves in general, it's almost unthinkable that such a thing could exist. But it's Alessandro's job to chase down such legends, and so, with the indomitable Mr. Floote, he finds himself in Alexandria, examining the great Luxor pyramid itself. Of course, a gentleman would hardly find himself in such an unfashionable city on a simple holiday, and this is where the titular Cat in a Jar comes into play. Poor Aunt Archangelica has lost her precious companion. Perhaps her nephew could help to preserve it in a most fashionable manner? As is always the case with a Parasol Protectorate story, there is plenty to be amused by. Alexia certainly gets her temperament - and her penchant for pockets - from her father. In fact, it's a shame that Alexia never got to know her father, because they are quite alike in a number of ways. But then again, they are so alike that it may not have only been their preternatural natures that would have driven them apart. They probably would have bonded over their frustrations over a certain histrionic Miss Phinkerlington. The Curious Case... is a welcome revisit to a beloved universe. Hopefully, Carriger has a few more stories of these characters waiting to be released into the wild. Highs: It's been said before, but bears repeating: Werewolves. Don't. Float. Lows: Now that Carriger has teased at the meeting of Alessadro and Leticia, this reader wants to see what happens on their way back to London. Verdict: The Curious Case... simply whets the appetite for more stories in this wonderful universe.